Hear ye Hear ye… calling all suckling pig fans! For the whole month of July, The Oriental Group of Restaurants are hogging the limelight with their roast promotions in various restaurants in the city. It’s a month of indulgence filled with plenty of classic as well as modern roast meats from suckling pig to Peking duck and more. We headed to Oriental Pavilion at Jaya 33 for an oinking good time with a few swine lovers recently. 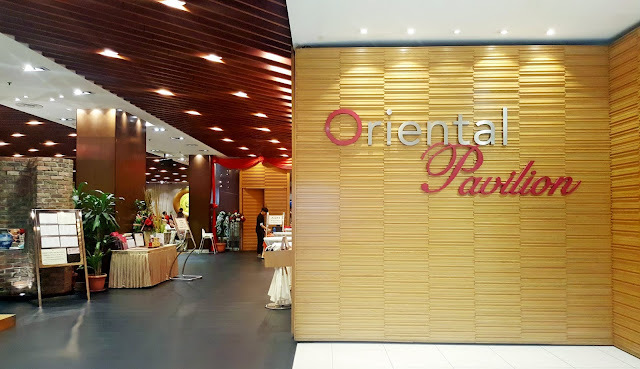 Oriental Pavilion, voted as one of Asia’s Finest Chinese Restaurants by The Miele Guide and also rated as the only Chinese restaurant in KL’s Top 20 restaurants by CNN Travel Guide, has always been a popular hot spot for classic Cantonese cuisine. From dim sums to Cantonese roasts and dishes, diners can opt to dine at their main modern dining room or one of the eight private rooms available. 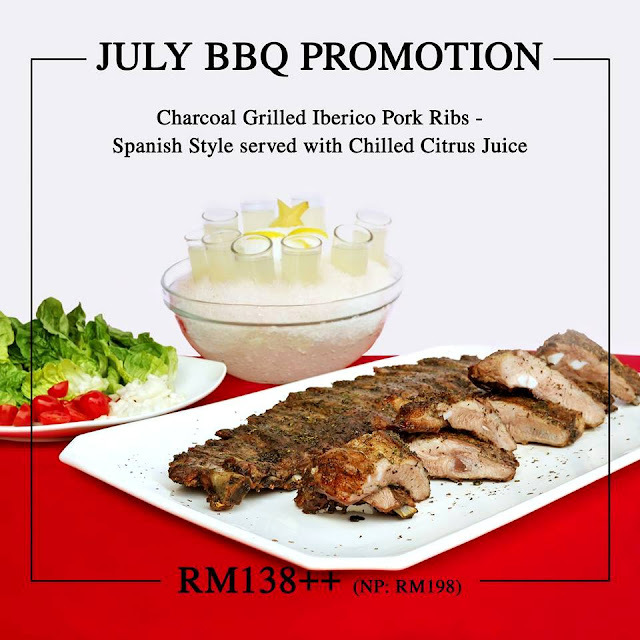 From now till 31 July, Oriental Pavilion is running specials on their famed Roast Suckling Pig and Iberico Pork Ribs. It takes special skills of a roast master to achieve luscious roasts, so diners like us can savor sumptuous roast suckling pig, roast Peking duck and more. The Oriental Group of Restaurants roast masters has certainly nailed their roasts to perfection! What makes a perfect Roast Suckling Pig? For me, the skin is the most important part of the dish. I need the acoustic sound of crunch upon savoring the skin as well as the even lacquered hue of the whole suckling pig as the main judging point for a perfect roast suckling pig. Choosing the right size of the piglet would yield just the right amount of meat and fat for a solid roast as well. Then one needs to also ensure that the little amount of meat is also tender, juicy and well-seasoned. The roasting skill is another crucial factor to achieving even roast as well as fabulous crispy skin. First up, Finest Macau Style Roast Suckling Pig, served with Chilled Citrus Juice and crisp greens. Brownies point goes to how gorgeous this piglet looked and from every angle too! The skin is beautifully and evenly lacquered with such a glistening skin that rendered many sounds of excitement from everyone at the table that evening. Unlike those suckling pig that one only enjoys the skin, this one has a little meat that oozed with much juiciness. 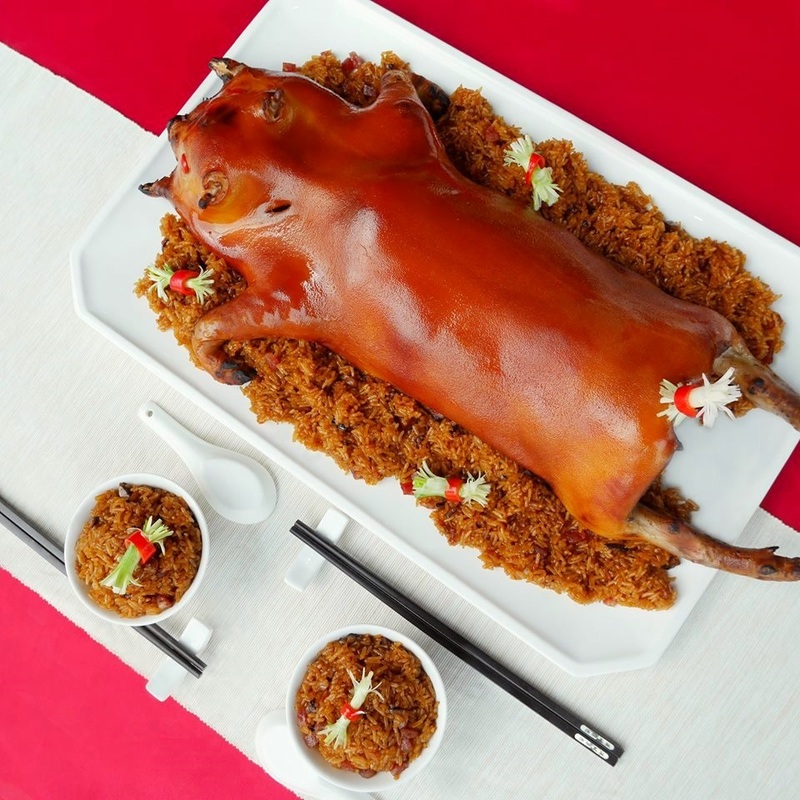 A closely guarded dry rub recipe, the special rub is what makes this Macau Style Roast Suckling Pig superior to all the other roast piglets. We heard the rub is so good, only the top two chefs in the group has the recipe for this special rub. After our homage to the pig with our lens, our Macau Style Roast Suckling Pig was cut up in thick pieces for easy consumption. The skin was literally to-die-for! The acoustic of the crunch of the skin was music to my ears. The little bits of meat was sublime and moist while the special spice rubs on the bones had me succumbing cavemen style (or cavewomen in my case) in gnawing the piece clean in doing justice for the piglet. Next up, another variation of the Roast Sucking Pig, BBQ with Glutinous Rice. This one is quite different from the Macau style one as the Roast Suckling Pig is deboned and served with steamed glutinous rice. Though it doesn’t have the same smoothness of the skin as the earlier one, this one still rendered a solid crispy lacquered skin with a lot of crunch. We enjoyed the leaner skin on this one and it certainly paired well with the soft and sticky glutinous rice studded with bits of mushrooms and Chinese sausage. It is served with a side of scallion and hoisin sauce though we think it didn’t really needed it because the glutinous rice was already very tasty with the Roast Suckling Pig. There is also a third variation of Roast Suckling Pig, BBQ with Foie Gras Sauce, which also sounds wonderfully delicious. 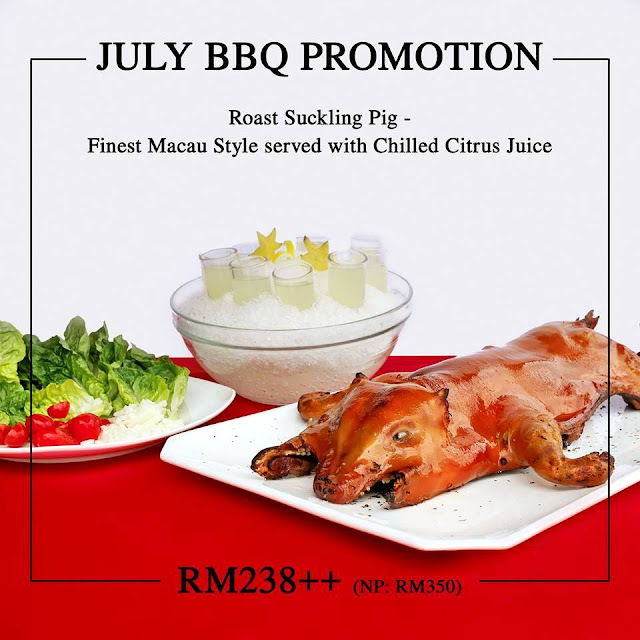 All 3 styles of Roast Suckling Pig is priced at RM238++ each (normal price RM350++ each), available until 31 July, 2017. There is another special swine that also stole much limelight that evening. Charcoal Grilled Iberico Pork Ribs Spanish Style served with Chilled Citrus Juice and crisp greens is a modern Chinese take on using the sublime black Spanish pig. An order of this dish features a whole rack of Iberico Pork Ribs Spanish Style served at tableside with crisp greens and Chilled Citrus Juice. The picture shown here was for two orders hence two full racks of ribs. The restaurant was so thoughtful to provide disposable gloves for the dish though we felt that we should just dive right in to savor the full finger-licking good sensation of the ribs. Look at the glorious rack of Iberico ribs! Generously seasoned with dry herbs as well as special marinade before roasting, the Iberico ribs were unctuously succulent with tasty fatty bits. The Charcoal Grilled Iberico Pork Ribs Spanish Style served with Chilled Citrus Juice is available on promotion at RM138++ per rack (normal price RM198++ per rack) until 31 July, 2017. While you are there, you might as well end your meal with Oriental Pavilion’s long list of desserts. We had their Lemongrass Jelly, Summer Coconut Jelly and Chilled Yam dessert that was light, fresh and a sweet way to end the dining experience. No reservations required for the Roast Suckling Pig and Iberico Ribs Promotion, just make sure you have a table booked ahead as Oriental Pavilion gets very busy, especially in the evenings. There are other Roast promotions going on at all other restaurants featuring different choices such as Peking duck and more so check out their website or Facebook for more information. Don’t miss this great promotion!